I'm hooked. Are you going to continue? There is an excellent paper on how Celts brewed beer (an entire brewery has apparently been found), although that is Iron Age. You can safely assume some of the techniques were borrowed or updated, since techniques tend to evolve with only some genuinely new inventions. 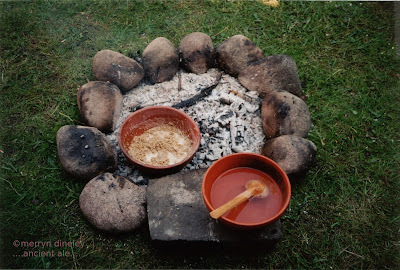 As for the Bronze Age, pots were Sun-baked (go to Stockport Museum and look for the pots found at the Mellor hilltop). This meant no direct heating was possible. You had to heat pebbles and transfer the heat. In fact, as beer was not then portable, anything drunk was likely made on-site. Expect the Mellor finds to include beer-making materials not identified as such - the archaeology unit from Manchester involved in the dig was good on reporting and brilliant at identifying even obscure features but lacked the imagination needed to contextualize the entire site and everything therein. Since the Celtic brewery used fire pits linked with trenches to smoke the sprouting seeds, but no such feature was specifically found by excavation or GPR, I am going to say that must be an innovation from an earlier design. When did the Irish develop their smouldering fire pit method of cooking? The two main pots of Mellor (the one from the settlement and the one from a nearby cairn) are sufficiently preserved to show the fingerprints of the potters - I don't recall if they did a chemical analysis of the interiors, but if they did then you can infer something about the ingredients and preparation method. Do NOT forget Werneth Low. The term Low appears frequently in place names and site names where barrows can be found. The Victorians were dumb when it came to preserving archaeological sites, but their records on finds are decent enough. Oh, and the Bishop of Disley was a hobbyist archaeologist in Victorian times. He recorded the barrows he plundered fairly well, so that might yield further insights. John Ryland Library is a few shelves of popular books and a vast number of poorly-documented warehouses. They will have what you want, but there is no telling if even the librarians know that. Mellor? When I lived in Manchester I vaguely knew some of the people who dug there. But that was a long time ago. Has it been published? I have not heard of any archaeological evidence for brewing found there. So more details would be interesting. Morning Merryn. Good article & good luck in your future experiments. I had read up some time ago on some experimental archeology done here in Ireland about brewing & I've hunted down the main links. Seamus, hello and have you seen their video of the Fulacht Fiadh brewing? Excellent stuff. I am doing this blog because I want to share my research. I have decided to start at the beginning of the story and I will eventually get around to telling the story of how I met the guys from the Moore Group ... it was in 2004 at the Beer Conference in Spain. I learned all about how to do hot rock mashing from these guys and there will be some photos of their Dublin WAC-6 demonstration in my next blog. Which I am working on. I am sure you did not mean your statement "The transformation of cereal into alcohol is done by heating up crushed malt with water to make a wort." Indeed I have presented this to my students (to THEIR delight) for years. 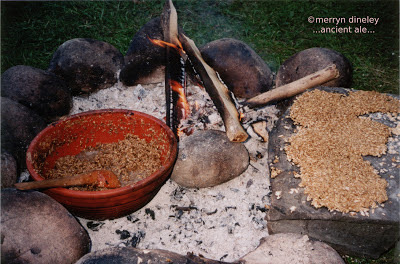 Even more interesting to them (and me) is that the origins of bread may stem from these mind altering early "experiments", when some of the left over mash inadvertently found its way onto the stones surround the fireplace.